Dubai: it's me! in the UAE! : day one. 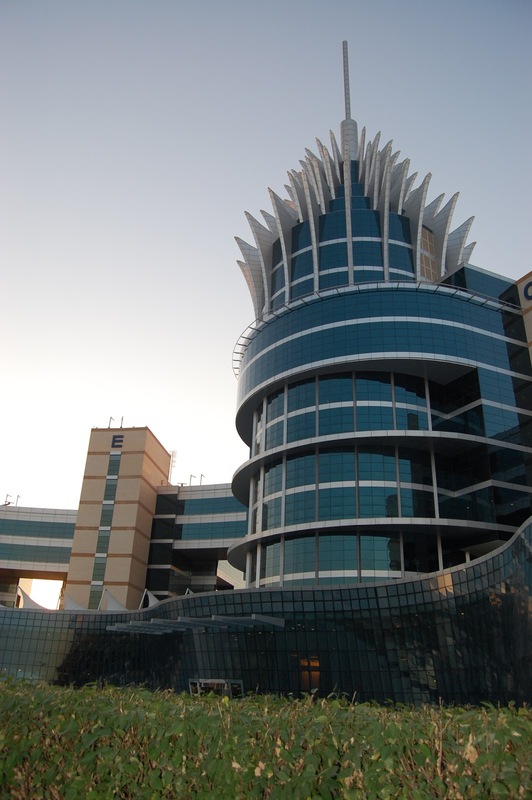 Current location of RIT Dubai. Today we got a tour of the RIT Dubai campus. It's two floors of a bigger building filled with other businesses and stuff. The facility is called "Silicone Oasis", also known as the "Pinapple Building" as you can see from the picture. We met Dr. Tom and Dr. Mustafa. They took us to lunch at a restaurant at the Silicone Oasis. Later at night we went to dinner at the Mall of the Emirates. It's the biggest mall I've ever seen....so far. We had dinner at a great Lebanese restaurant called Karam Beirut. Dr. Mustafa did all the ordering. We had a ton of awesome apetizers and food. The best part of the restaurant? It over looked the Ski Dubai facility. Coolest thing ever. Can't wait to go back to the Mall of the Emirates and try out some indoor skiing! First group picture of the trip!! Before going to dinner at Karam Beirut. Andy, Maddie. Front row from left: Allie, Nina. Just saw what a wonderful place you are at. Such a nice group of friends, so happy for you. Have a great time, proud of you. Lots of love.